The first multicellular animals appeared during the Ediacaran. Toward the end of the period, there also appeared small worm-like creatures which were the first animals that could move by themselves. Biological diversity was very limited during the Ediacaran. Scientists have only discovered around 100 different species. The earliest organisms during the Ediacaran had multiple cells; but they most closely resembled small sacks that consisted of folded membranes. These primitive organisms had no mouths, intestines or other internal organs. Instead, they absorbed nutrients directly through the membrane. The thin folded membrane increased the surface area through which nutrients could be absorbed. The first ”real” animals appeared toward the end of the period. Among other organs, they had muscles and intestines. 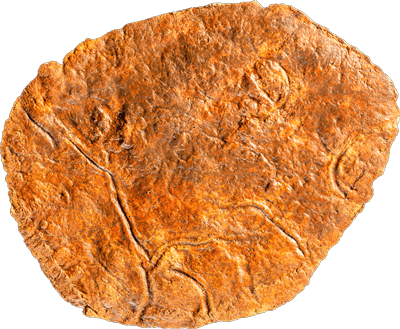 The first animals that could move by themselves evolved during the Ediacaran. That ability enabled them to actively search for food and mating partners. They had muscles and liquid internal skeletons, somewhat like worms. Fossil traces of crawling in sediment are called Helminthoidichnites. Fossil traces of these animals’ movements have been left in sediments on the ocean floor. Those traces indicate that they moved either by gliding over the ocean floor or by digging into the top few millimetres of sediment. The sizes and shapes of the fossil traces suggest that the first mobile animals were small and worm-like. But no fossil of any such animal, itself, has yet been found.